Would you like to save money on any Lexmark toner cartridges? Buying any new Lexmark C500 toner with us makes it possible for you to save a great deal of time and money. Our business have a reduced price promise so you only get wonderful deals for Lexmark C500 toner cartridges without having to go shopping with overpriced high street suppliers In addition, we only ever distribute Lexmark C500 toner that are both inexpensive and also precision engineered and so why be satisfied with anything less? Amazing Deals Now On All Lexmark C500 Toner Cartridges! Here at Cartridge Save you get fast and free delivery on Lexmark toner cartridges. The particular great value Lexmark C500 laser toner can be ordered online at our checkout page so don't miss the opportunity and place an order now to save the most. However, you could buy a cheap Lexmark C500 toner by just contacting us on the orders line. Customer satisfaction is Cartridge Save's top priority and so we give you a no-hassles cash back guarantee for Lexmark C500 toner to give you absolute peace of mind. For the ultimate deal for Lexmark C500 laser toner cartridges order today with Cartridge Save. The Lexmark C500 is a workgroup printer that prints up to 31 pages per minute in black and white and 8 pages per minute in colour. This laser colour printer is built for a small business or an office that requires great black and white prints and reasonable speeds in printing colour. A maximum resolution of up to 1,200 x 600 dpi in both colour or black and white makes this printer excellent for printing sharp text or high-quality graphics. This printer is also quick and will have a first print out in only 13 seconds in monochrome or 19 seconds in colour. A 200 MHz processor that is paired with 64 MB of RAM will allow a printer to easily manage print information without unnecessary complications. The Lexmark C500 printer does not occupy much space and will fit just about anywhere with dimensions of 48.01 cm in width, 41.91 cm in depth, and a height of 38.60 cm. At a weight of 28.98 kg, it is reasonably heavy and will require multiple persons to lift or transport. Standard Lexmark C500 toner can create up to 2,500 pages at a five per cent coverage rate (black) or 5,00 pages for the high capacity version of the Lexmark C500 cartridge. A USB cable or Ethernet cable are the primary means of connection and installation is accomplished within minutes. The C500 can also print on an abundance of media which include cards, envelopes, glossy paper, labels, transparencies, and plain paper. This printer is also capable of producing up to 35,000 pages per month with ease. 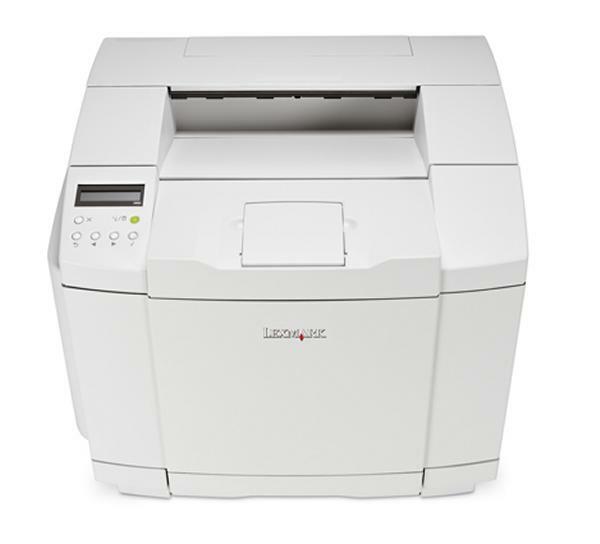 Additionally, the Lexmark C500 is also inexpensive and at this price is one of the more affordable printers in its class with print speeds that keep up with the competition. This printer does not come with a scanner, copier, or fax machine and many not satisfy some office needs. The starter Lexmark C500 toner cartridge that comes with the printer only creates up to 1,000 pages and will have to be replaced soon after purchase.